PRODUCT DETAILSCap by adidas. adidas 3-Stripe detail. Panelled crown. Just give it a quick wipe with a damp cloth to clean. Product code: BK7282. Product Code: BK7282. Adidas Trefoil Hat. A RELAXED TREFOIL HAT THAT ADJUSTS TO FIT. Made with a pre-shaped brim, it features an adjustable strap-back closure for a comfortable fit. NRLGold Coast Titans adidas Unifit Hat. Rugby League Baseball Cap. Stretchy Fit. Suit Youth/Adult. In excellent condition as shown in pics. Stitching Excellent. Loved and Cared for Condition. Snapback strap. RODUCT DETAILSCap by adidas Originals. Embroidered logo. Machine wash. Cotton twill. 100% Cotton. The adidas Climalite Running Cap offers essential coverage ina lightweight design to keep you cool, dry and protected during long runs. Made with climalite fabric to keep you dry. Pre-curved brim for shape, Hook-and-loop adjustable back strap for perfect fit, Reflective details for added visability and UPF 50 UV protection from the suns harmful rays. Snapback strap. PRODUCT DETAILSCap by adidas Originals. Just give it a wipe with a damp cloth. Classic NBA Snapback Hat. NBA Authenticity Sticker Under the Brim. white Colorway Underneath Brim of Hat. High Profile,Official Logo graphic Under Visor. Has a thick, Durable Panel Material. 6 Panel Construction. 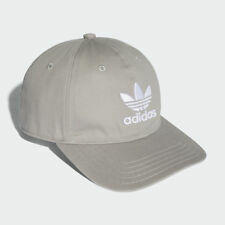 The adidas Daily Mens Baseball Cap is a style must have from head to toe. Constructed in a classic six papnel design with contrast panels, embroidered vent holes for breathability, Pre-Cirved brim and adjustable snap-back at rear for fit. Finished off with a trademark adidas logo added to the front. Style Baseball Cap. Color White. • Adidas logo on center back. • Two tone crown & visor. • Flat embroidered graphic on front panels. This is not an acceptance of your order. Once you receive a despatch notice from us your order has been accepted. Capy // Cap. are in this Capy Quality and Design at the highest level! eye-catching logo MIAMI HEATS on the front. adidas flag on the left side. usual high quality of Adidas. Head circumference: 58 cm. Style Baseball Cap. Color BLACK. Size One Size.